Winter months present special concerns for our beloved cats and dogs. While obvious needs, such as extra warmth for outdoor pets, are on all pet lovers’ minds, there are other needs that we need to take into consideration as well. Below is a great guest article addressing these very needs. Like humans, pets can experience winder doldrums. Even those living in warmer weather regions are still affected by seasonal changes, which can be especially tough on dogs and cats–particularly those that are used to spending time outdoors. Beyond the obvious challenge of pets getting less exercise during the winter months, dogs and cats often experience less emotional stimulation during this period and can suffer a variety of adversities, including excessive weight gain, irritability, anxiety and even clinical depression. This can lead to a variety of unsavory behaviors and dissatisfaction for all involved. The more outdoor-oriented the pet, the higher probability that these and other problems will present and persist through the season. Most dog breeds need to go outside 2-3 times a day, not only to relieve themselves, but also to get some form of exercise and sensory stimulation. Dogs are more likely to go outside in nearly any kind of weather and often love a romp in the snow. Taking your dog outdoors will trigger its natural play instincts. Running, jumping and chasing are natural ways to energize your pet, burn calories and boost metabolism. If you’re not up to the task amid Mother Nature, consider hiring a professional dog walker to happily take on the duty. Indoors, tried-and-true games like fetch, tug-of-war and wrestling can also serve as a great workout that also stimulates a pet’s appetite. Cats also love to pounce and play, and if they’re stuck in the house you can easily brighten their day with 10-15 minutes of play each day. String, laser pointers, objects on strings and other enticing toys dragged around get your cat into chase mode, keep her busy and burning energy. Find or install a perch by a window where your cat can watch the birds. For those cats that pine to be outdoors, the marketplace has an abundance of outdoor enclosures that also allows cats to run, roam and prance freely in the invigorating fresh air. Of course, moderate the time spent in these enclosures based on the winter weather conditions. For both dogs and cats, keep a set of toys and laser pointer handy for an energized and sustained play session, either indoors or out, at least once daily. When outdoor play just isn’t an option, there are a number of motorized animal treadmills on the market today that are entirely enjoyable and effective for exercising both Fido and Felix. If your dog or cat doesn’t get outdoors as much in the winter as they normally do, it likely doesn’t need to eat as much food. Reducing food and calorie intake generally means less weight gain and more energy. If you often give your pets treats, consider hiding them inside toys, such as freezing kibble inside a “Kong,” to give them prolonged busy work. As with humans, weight maintenance is all about portion control. Feed your pet using a designated measuring cup so that you know exactly how much food they’re consuming each day. If you still aren’t getting the desired results, call the pet food company for dietary recommendations to ensure you aren’t over-feeding—especially as seasonal dietary requirements change when a pet becomes less active. Automated pet feeding systems are also helpful. These tech tools utilize a wireless tag attached to a pet’s collar to regulate and monitor one or more pet’s food intake to ensure the pet isn’t eating too much or too little at once or throughout the day—also keeping multiple pets away from each other’s food. Pets react to illumination just like humans do. Their energy level increases when the light is brighter. According to Animal Behavior College, “The People’s Dispensary for Sick Animals found that approximately 40 percent of dog owners saw a considerable downturn in their pet’s moods during the winter months” and that related symptoms in pets “typically manifest as behavioral changes such as inappropriate soiling, aggression, lethargy and separation anxiety.” The report notes that “Light is intimately tied to the functioning of the pituitary and endocrine glands, and can stimulate the body to release hormones that have an uplifting effect on mood.” If it’s too cold to go out, simply open the drapes and let the natural light in, turn up your indoor lights, and consider replacing bulbs with the full spectrum or daylight variety to better simulate a daytime environment. A company called Pawsitive Lighting, has even developed a light box to help conquer those wintertime blues. Scented toys can really engage an animal’s interests and natural stalking instincts, also keeping them occupied and mentally focused as they try to find the source of the smell. Luckily dogs respond to a variety of smells and there are seemingly infinite availability of toys that engage canine olfaction—alone and in combination with other senses that can be concurrently engaged. A game of hide and seek can go a log way with your pooch! For cats that respond well to catnip, there are catnip and other “play sprays” that can be squirted onto indoor climbing structures, cardboard boxes, and scratching posts. A multi-story cat climber or “tree” with strategically placed low-cal treats or scented play toys can readily get kitty jumping from level to level and its heart pumping in kind. With just a little planning, you can help ensure your pet’s winter season remains happy and healthy, with a great quality of life for everyone in the household. Paul Mann is the Founder and CEO of Fetch! Pet Care—the nation’s largest and most trusted franchisor for professional pet sitting, dog walking, and pet fitness/exercise services—serving thousands of pets and pet parents throughout the United States from coast to coast. He may be reached online at: www.FetchPetCare.com. I think that most of us cat lovers don’t really realize how often cats are harmed (and often killed) by poisons they come in contact with in their home or yard. I know that when I read that, in 2011 alone, the ASPCA fielded 166,000 calls about cases of pet poisoning, I was alarmed. When you consider that at least that many probably went unreported, it’s staggering. While we think we know what things are harmful to our precious cats and what things could even poison them, it’s always a great idea to refresh ourselves. It’s also a smart idea to let anyone and everyone who comes into contact with the feline members of the family know that some things are completely off limits. WebMD recently ran a great article detailing the top cat poisons. A few are listed below – but I hope you’ll click through and read the entire list. Please pass the link around to everyone you know. By doing so, you could be saving a cat from a world of pain, sickness and suffering. What’s more, you could save her life. 1. Medications for people. Pets have a much greater sensitivity to many of the common over-the-counter and prescription medications that may be in your home. Non-steroidal anti-inflammatory medications, such as ibuprofen or naproxen. The most common cause of pet poisoning, these painkillers can cause ulcers in the stomach and intestines, and kidney damage. Acetaminophen (Tylenol) is particularly toxic to cats, resulting in red blood cell damage. Just two extra-strength tablets may prove fatal to felines. Antidepressants may cause vomiting and, in more serious instances, serotonin syndrome – a dangerous condition that raises temperature, heart rate, and blood pressure, and may cause seizures. Methylphenidate, an attention deficit hyperactivity disorder (ADHD) drug, is a stimulant for pets, raising heart rate, blood pressure, and body temperature. Lilies. Ingesting even small amounts of Easter lilies and related plants can cause severe kidney failure in cats. Azaleas and rhododendrons. These pretty flowering plants contain toxins that may result in vomiting, diarrhea, coma, and sometimes even death. Tulips and daffodils. The bulbs of these plants, if ingested, may cause serious stomach problems, convulsions, and damage to the heart. Please read the other cat poisons and keep your precious cats safe. Some of the hidden dangers will surprise you. We all have to keep in mind that leaving residual household cleaner on the floor (or anywhere our cats sit or lie) could pose a real problem. They may not lick it off of the floor or table (though I wouldn’t put it past some cats! ), but if any gets on their fur, they WILL lick it when they give themselves a bath. Keep your cats, dogs, and children safe by fighting ants with natural, household products. Leave the chemicals in the labs. Like most people, Spring means more around our house than March Madness, planning flower beds, and welcoming baseball back. It means it’s time to go to war against invading ants. For those of us with pets and/or children in the house, we’re always looking for ways to arm ourselves naturally. Fortunately, getting rid of ants naturally can be done. Dust baby powder directly onto ants and around the places they enter your home. Wash the areas they travel (their little ant highways!) with a 50-50 combination of white vinegar and water. It masks the smell ants need to navigate. Place bay leaves or cloves where ants enter your home. Draw a line with chalk across the place they enter your home. Coffee grounds repel ants (no accounting for taste), so dust coffee grounds around areas you frequently see ants. In addition to cayenne pepper, bay leaves, coffee grounds, and cloves, ants are also turned away by cinnamon, mint, black pepper, and chili pepper. Citrus peels and cucumber peels smell great to us but they repel ants. I’ve used both with miraculous results. Photo: The beauties in the picture are Adam and Alexa! Like all kids, cats love the holidays. One of the highlights each year for me is seeing the reactions of our cats when the Christmas tree, ornaments, lights, and all the other decorations come out. Their eyes light up as they insist on getting right in the middle of everything! While cats make the holidays even sweeter, it’s a time when we have to pay close attention to potential dangers for our little ones. Many of the following definitely fall under the heading “common sense,” but we all get so busy this time of year, sometimes we need a few reminders. Our cats lives are definitely worth the extra time it takes to read over cat safety tips, so let’s have at it. Even though it’s tempting to give our cats “special treats” such as ham, turkey, whipping cream, icing, etc during the holidays, come up with a better plan. Buy special Cat Treats and dole them out instead. Cat’s insides are very, very special and they simply can’t process the food that we’re able to process. Why take chances, right? Make certain your Christmas tree is VERY secure and stable. 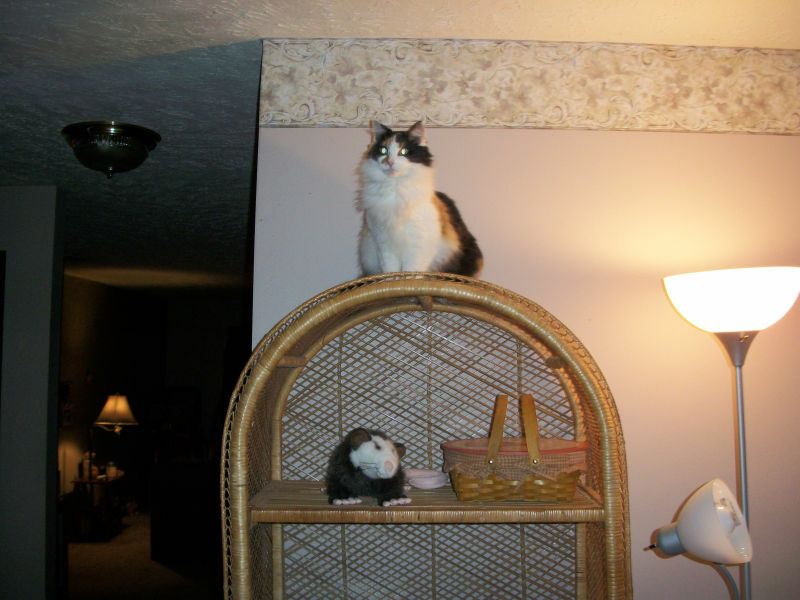 Many cats like to climb them (Prissy always did!) and the last thing you want is the tree toppling down on top of your cat. If you have a live tree, be sure your cat doesn’t drink from the water. Cover it in some fashion. Stagnate water is a health hazard, for one thing, and for another who knows what kind of chemicals or fertilizers could transfer from the tree into the water. This water could make your cat very sick at best and could prove poisonous at worst. If you have cats (or dogs or small children for that matter) in your house, you’d be better off avoiding tinsel altogether. Cats find tinsel completely irresistible – so shiny and easy to play with! However, tinsel easily gets into their digestive tract and can cause obstruction (which requires surgery and a great amount of pain for your cat). Tissue paper, popular for putting in gift bags, is something else that cats can get into their digestive system, which would then wreak havoc. If you use tissue paper, make certain it’s closed up tightly within the bag and be sure to throw it all away immediately upon opening. Beware of long ribbons as well. Cats can get them wrapped around their necks, creating a choking risk. They’ve also been known to get these ribbons stuck in their throats. Never leave burning candles unattended, for obvious reasons. Anything that involves burning oil, melted wax, or flames is simply too risky. Potpourri pots can EASILY be pulled down by a cat who is either attacking the cord or simply running from one place to another. Again, it’s just not worth the risk. Cats LOVE gift bags – the bright, fun, “crinkly” bags spell GOOD TIMES to an inquisitive little girl or boy! I always leave a few lying around for Alexa, much to her delight. However, I make certain that the strings are unattached – the larger bags are especially dangerous (the ribbon loops look like little nooses!). I already mentioned “treats,” but this one merits its own mention: Chocolate is a huge NO NO for cats (dogs too). Chocolate can poison a cat, plain and simple. Also, make certain your cats never eat anything containing xylitol. Again, what’s the best way to make sure your cat doesn’t digest food that’ll harm her? Feed her only cat treats and cat food. Also, remember that just because you don’t hand it to your cat doesn’t mean she can’t get to it! Keep candy and all other foods out of your cat’s reach. No doubt you (like me) fill your cat’s stocking with toys and special treats. Make sure the toys, themselves, are safe. It’s always best to buy specially made cat toys because you pretty much know for certain they won’t contain poisonous paint or harmful parts. Cat toy manufacturers have a lot of codes they have to live up to and that always makes me feel safer. Remember that long, stringy toys can cause a lot of nightmares, as can small parts that can come off and lodge in your cat’s throat or intestines. Make sure no turkey or ham bones are given to your cat and be sure they’re disposed of properly. Keep Holly (the plant, not a relative!) out of the home. Holly can cause pets to suffer needlessly with nausea and diarrhea. Mistletoe can cause gastrointestinal upset as well as cardiovascular problems. Many lilies lead to kidney failure and death for cats. Why take any chances? Buy artificial plants and keep your cat safe and healthy. If there’s a lot of commotion, noise, and guests, some cats may want to retreat to another room for some much needed peace and relaxation. If this is the case, be certain they have their essentials nearby: Litter box, water, food, and a comfortable place to sleep. If your cat does seek refuge, don’t try to coax her out – she’ll come out when she feels ready. Cats are small children in fur coats. Everything is a toy and everything is a game. Like children, they cannot discern what is safe and what isn’t. It’s up to us. To keep them safe, we have to think like they do and look at the world from their viewpoint. Seek out anything that poses a threat to your cat and remove the danger. Cats are perhaps the most emotionally in-tuned animal in the world. They’re like emotional sponges, as one vet put it. They pick up on our moods as well as the excitement going on around them. Sometimes the chaos and excitement will cause them to act differently than normal. They may sleep more, may be cranky, or may need more of your attention and reassurance. Cats aren’t wild about change. They crave consistency and want their little world to pretty much stay the same. Same feeding schedule, same play time, same “couch time,” and same television routine! Cats feel stress and nothing causes them to stress out quite like change, so keep things as normal as you possibly can during the holidays. Also, cats HATE sharing their parents with other people or situations. They want their mom and dad’s attention and feel distress when they feel that someone or something else is taking any of this attention away from them. If children (or Heaven forbid other pets!) come into your home during the holidays, be sure to reassure your cat(s) and involve them in everything you possibly can. I hope you and your cats have a fun, safe, and wonderful Christmas and holiday season! I’ll be adding more cat lovers gift ideas, cat toys, and cat ornaments – so watch for them. Help Your Cat Live Longer! Good on you! There you are, reading a cat blog article about keeping your cat healthy and extending his/her life. As a cat lover, myself, I applaud your love for your cat(s). We all want our precious little furry babies to live as long and as well as possible. Fortunately, there are lots of things we can do to help make that happen. 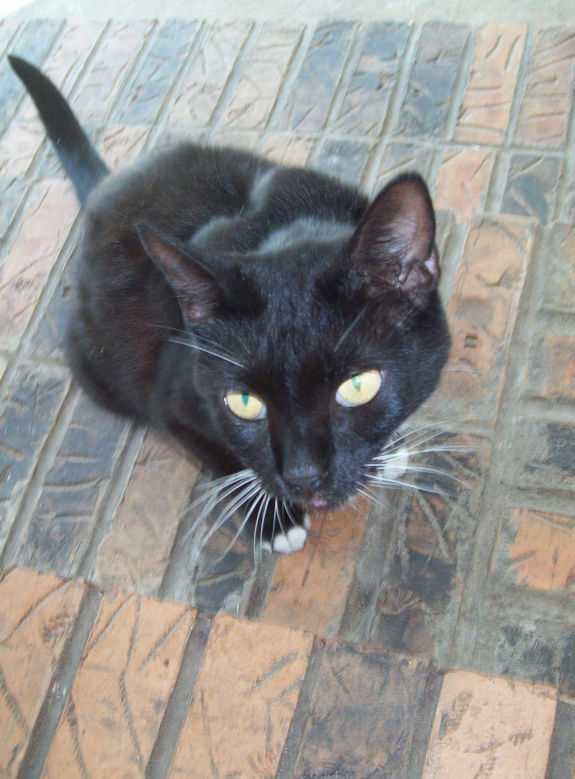 If you’re a regular reader, you probably already know that we had a much (much much much, much…) loved cat named Prissy, who I named after my favorite Gone With the Wind character, who lived for over 20 years. Within those years… 20, wow, that’s a lot of years…. she only had to go to the vet once, when she was 3 – for a sinus infection of all things. Prissy was a house cat, which certainly helped her achieve such an impressive lifespan. In fact Keep your cat safe and secure inside your home at all times was listed number 1 on Real Age.com’s Cat Health Tips for Helping Your Cat Have a Younger Real Age. 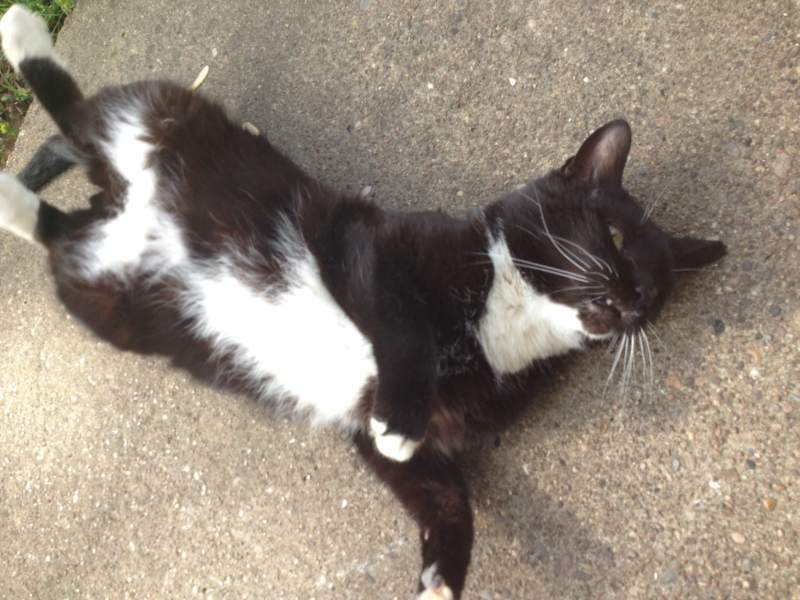 Of course, there are times when your cat has to live outside the house rather than inside the house. They’re still much beloved family, of course, their section of the house simply doesn’t have a roof. If your cat has to live without a roof, as some of our cats do, read How to Help Your Outdoor Cats Live Longer. Make certain your houseplants are safe. Some houseplants are poisonous and shouldn’t be allowed in a cat’s vicinity EVER. I wouldn’t even keep one on the highest shelf in a room my cat never visits. Can you say not worth it? No plant is worth making a cat sick and it certainly isn’t worth the risk of killing a cat! Please see Toxic and Non-Toxic Plants for Cats. Needless to say, if you have dogs, be sure to check the same website for poisonous plants for dogs. If you have an indoor cat, be certain that all guests to your home know that the cat is not allowed outdoors. Some people have cats that come and go and may automatically assume that your cat does so as well. Please don’t allow your cat to lie on or play near ironing boards. I see a lot of precious pictures online of cats lying on ironing boards (horrifyingly enough, sometimes the iron’s plugged in and is next to the cat) online. I used to keep our ironing board up most of the time (with a blanket on top) because Alexa loved to lie on it and look out the window. One day, she had a terrible accident, though, and somehow managed to pull the ironing board down on her when she quickly jumped off. One of the metal legs landed on one of her tiny back legs, breaking her leg in two places. I’ll NEVER forget the pain she was in or the helpless, sick feeling I had. She had to have a cast and had to spend months in a large cage. It was absolute hell for me and her. When we first brought her home from the animal hospital with a cast on her leg, I had trouble getting her to agree to the cage. At one point, she backed into a corner as tears, literally ran from her eyes (as well as mine!). It’s an image that will stay with me forever and will prompt me to beg cat lovers to keep their ironing boards put up at all times. PLEASE. If you have a cat blog, a facebook page, or a Twitter account, help me spread the word about the dangers of ironing boards for cats. Always remember how inquisitive and nosy cats are! 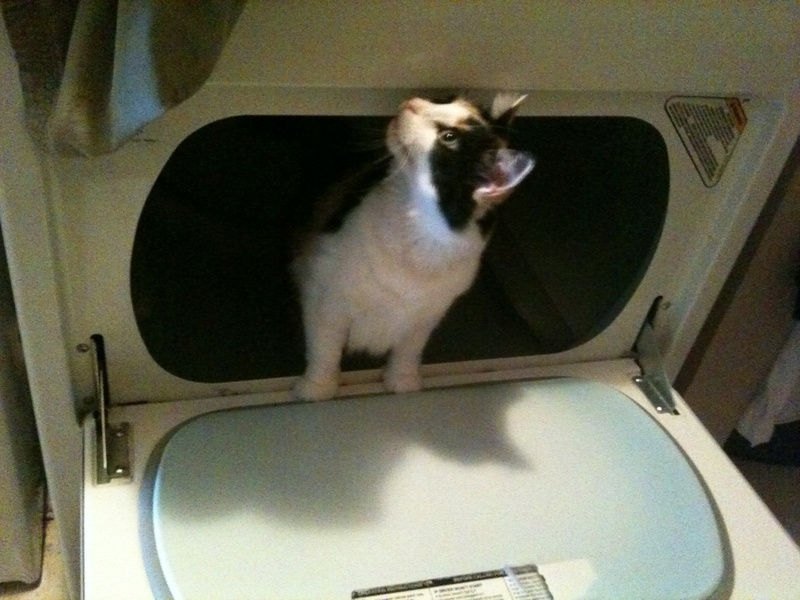 Be certain to always double check the dryer before closing the door – even if you’re almost certain your cat never came into the room. 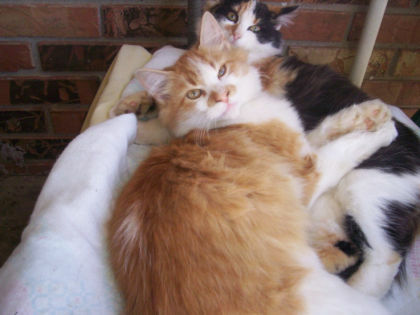 Click HERE to read the Real Age.com article about adding years to your cat’s life. Great stuff! We do everything in our power to care for, nurture, and protect our cats. We buy the best cat food available, we provide our cats and kittens with engaging cat toys and can often be found on the ground playing with them – having at least as much fun as they are. We know that playtime for cats isn’t just fun, it’s healthy and provides physical activity and mental stimulation that are very, very good for them. In fact, when it comes to cat health, playtime is vital. But, as mindful and lovingly careful as we are, there are still areas we need to improve in. There are plenty of hazards in our home and yard that pose potential harm (often fatal) to our cats. So, to promote better cat safety and care, we’ve rounded up what we believe to be a comprehensive list of tips, advice, and information for keeping our cats safe from harm and illness. Like children with skin, there’s only so much we can do to protect children with fur! However, since they mean the world to us, we will do everything and anything within our power. Personally, I firmly believe that a home with cats (or dogs, for that matter) should be treated the same as a home with small children. When children are small, we can’t count on them to reason what might or might not be harmful, so we remove all perceived harm and danger. Animals aren’t capable of always recognizing harm either. They’re very childlike in many ways and one of the most obvious ways is that they live in the moment. They see something that looks like a good time, and off they go! They’re also like children in this way: Almost everything goes to the mouth! Alexa reminded me of this truth a few nights ago. I was fixing an Asian-inspired meal and apparently, somehow, a crispy Asian noodle hit the floor. I hear a little crunching from a few feet behind me and I turn to see her with the noodle half-in, half-out of her mouth! She’s nothing if not accident-prone, so I distracted her with her favorite cat treats and threw what was left of the noodle away. Alexa, being Alexa, would have probably choked on the noodle (or stuck it in her ear, or broke a couple of teeth, or poked herself in the eye…). As I was giving her a couple of treats, I told her that she was “Just like a 2 year old baby.” And it hit me that, yes, in fact, cats are very much like 2 year olds – which is why we need to do periodic “child-proofing” inspections around our home, garage, and yard. Ironing Boards. First of all, the iron is an obvious danger. Be certain that you never leave an iron plugged in if you aren’t right beside it. 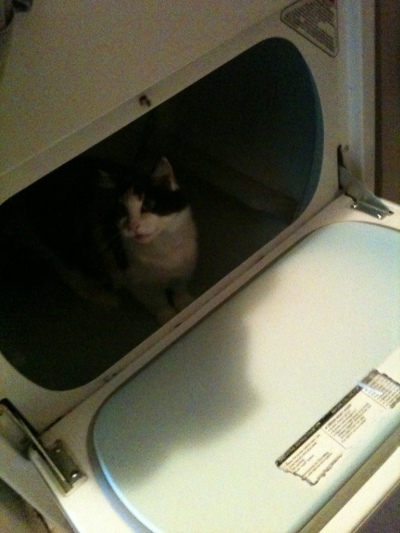 Also, when you unplug the iron and leave it to cool down, be certain that it’s completely out of your cat’s reach. Even the ironing board, itself can be a safety hazard. Although it’s actually the only time I’ve ever heard of the incident (again, it’s Alexa we’re talking about! ), a few years ago, our beautiful little baby (shown above, looking for something to get into) broke one of her legs in two places when she ran to jump on an ironing board. She somehow managed to pull it down on herself. One of the metal legs fell on one of her tiny legs and broke it. Needless to say, she was in a great deal of pain.. which probably took a couple decades off of my life…. and had to have multiple veterinarian visits, surgery, a leg cast, and cage confinement for nearly two months. I will give my husband this, he found the biggest cage known to exist! It was agonizing and could have been completely prevented if the ironing board had not been left standing. Yes, it’s a one in a million type of scenario – but if you’d seen how much pain this beautiful little cat was in, you’d know that one in a million is well-worth preventing. Human Medications. Unfortunately, for several years now, human medications have been number one on the ASPCA’s list of common hazards. The ASPCA manages thousands upon thousands of calls each year involving prescription and over-the-counter drugs such as painkillers, cold medications, antidepressants and dietary supplements. Again, approach safety measures as you would if you had a small child in the home. They can and they will find a way to get into anything that peaks their curiosity. Be sure to lock up all medicine and never leave any pills, vitamins, herbs, or supplements lying around in the open. Safety for Outdoor Cats in Extreme Weather. For those of us who have outside cats AND inside cats, we know that some simply can’t come in – our babies are destined to live just outside of the walls. When it’s extremely hot or extremely cold, we have to do everything in our power to keep them safe and as comfortable as possible. Please read Keeping Your Cat Safe in Hot Weather for tips on dealing with summer. As for winter safety, you might want to consider the KatKabin! It’s a beautiful and cozy cat house that stays warm and dry inside. Click the link to read my review. Bullet is actually cuddled up inside the KatKabin now. I have it up off the ground, on a sturdy wide shelf under the carport. He doesn’t seem to mind one little bit that it’s hot pink either! I went out earlier (it’s the dead of winter now and we have several inches of snow on the ground) and stuck my hand inside the KatKabin. It felt as warm as it does in our house! Always be sure to keep your cat’s water bowl filled and unfrozen. Jelly Bean drinks more than any cat I’ve ever seen, so (in addition to the fact that there are four of them out there) I actually have to refill their water bowl many times during the day. During winter I go out even more often, to replace the frozen water with fresh water. Jelly Bean’s always the first one in line! House Plants. Azalea, rhododendron, sago palm, lilies, kalanchoe and schefflera can be harmful to pets. Lilies are especially toxic to cats, and can cause life-threatening kidney failure even in small amounts. I don’t allow lilies in the house OR in the yard. Poinsettias are also known to be toxic. When it comes to house plants, I actually allow very few in. Not only do I not want to take any chances with little Miss If There’s A Way to Cause Drama, I’ll Do It – I know she’ll just make a spectacular mess! As for flowers I add to my flower beds and pots outdoors, I always research them online to make sure they’re safe. Pet Medications and Tick and Flea Products. Many well-intending pet parents mismanage and misuse pet medications and products. Please ere on the side of extreme caution. In 2009, the ASPCA managed 7,680 cases involving animal-related preparations such as non-steroidal anti-inflammatory drugs, heartworm preventatives, de-wormers, antibiotics, vaccines and nutritional supplements. Also, if you have an elderly cat or dog – I honestly wouldn’t apply or use anything without my veterinarian’s advice. The last summer Prissy was alive, she and Alexa had a little bit of a flea problem. I got some “over the counter” flea medication to use. It was the type that you place a few drops between their shoulder blades. I used it on Alexa, without incident. However, given the fact that Prissy was 20 years old – and not in the greatest shape – I didn’t use it on her at all. Somehow, it just didn’t seem safe. I simply combed over her little body and removed fleas monkey-style. Not long ago, I read that applying medicine like this to older pets can be very dangerous and cause them to have seizures and suffer greatly. It was a clear case of allowing intuition to guide the way. Always, always, always treat older pets with extreme caution, love, and tenderness. Garden Products, Chemical Hazards, and Automobile Products. Each of these can pose great harm, often fatal, to pets. Again, ere on the side of caution and keep all of these products UP off of the ground in your garage, home, or carport. Keep lids screwed on VERY tightly and immediately wash up any spills or leaks. My husband not only keeps all of these products up, off the ground, most of them are even in buckets or other containers. Ribbon, thread, and even dental floss. All of these look like nothing but a good time to a cat but they can easily get choked on them. 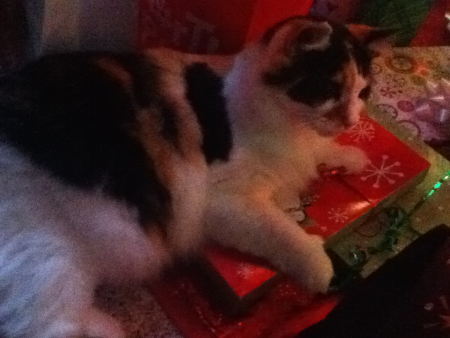 The long, “curly” ribbon so popular at Christmastime is a potential nightmare to cats. Many cat parents use it as a toy, but a cat’s claws can shred it to tiny fibers that they can then ingest – either intentionally or unintentionally. They’re also a choking hazard. Wobbly tables and plant stands. Double-check the tables and, in particular, plant stands in your home. Some tend to be wobbly, especially on carpet. It’s the ideal situation for a cat to either run past (and topple over) or take a running dive at and come crashing down with it. The latter was Alexa’s ironing board maneuver. So graceful. Mini Blinds. If your cat is anything like Alexa (Heaven help you both), she’s fascinated with mini blinds. When they’re closed, she loves to shove her head between the rungs and look out. When they’re open, she loves to attack the cord. I have to keep a constant eye on this little girl! I’ve learned that I have to keep the cords folded up out of the way and, during the day, we raise the blinds at the windows she frequents. Cats can hang themselves in mini blinds, so take great precautions. Household Cleaners. Treat all household cleaners as you do garden products: Keep them entirely out of the way of your pets. Also, keep the toilet lids down at all times, so the pet doesn’t try to help themselves to a cool drink – not only is this gross (really, really gross), if you use toilet bowl disinfectants or cleansers, it’s potentially poisonous. Speaking of Toilet Bowls… Keep the lids down at all times. If a cat were to try to jump on top of the toilet, and the lid isn’t down – catastrophe. Candles. Never leave candles burning in a room you aren’t in. Not only is it hazardous for your cat, it’s hazardous for you! Hot Scented Oil Devices. Hate these! There are just far too many possibilities for harm. They can be spilled, knocked over, touched… Even if you have one set up high, in a place you’re sure your cat would never go – they could conceivably grab the cord and pour hot oil on top of them. Can you imagine the pain?!?! Stove Safety. As with Children, keep all pot handles aimed toward the back of the stove. It’s too easy to knock against one and send a hot pot crashing to the floor. Cat Toys. Always double-check your cat’s toys and inspect them for frays, cracks, and so forth. Many chocking incidents can be prevented if you make sure everything is in place when it comes to cat toys – make sure nothing’s spilling out and that there aren’t any splintered pieces that could pose a problem. Also, make sure standing scratching posts are secured in place – be sure they don’t topple over. Heavy Metals. No, not music (although if played loud enough, I’m sure a cat wouldn’t appreciate it much!). According to ASPCA, heavy metals such as lead, zinc and mercury, accounted for 3,304 cases of pet poisonings in 2009, alone. Lead is especially dangerous, and pets are exposed to it through many sources, including consumer products, paint chips, linoleum, and lead dust produced when surfaces in older homes are scraped or sanded. Pet Food Recalls. Always stay on top of recent cat and dog food recalls. Sadly, this has become a regular part of pet parenting. Would these pet food manufacturers please get their acts together?!?! Make it a point to check cat websites such as this one regularly for pet food recalls. Also, here’s a little tip. Go to Google and set up a Google News Alert (click the link to go directly to the page you need). Enter the term, “Cat Food” (add another for dog food if your cat has a canine brother or sister!) in the field marked Search Terms, then choose the other specifics and enter your e-mail address. Whenever there is “news” involving cat food, you’ll get an alert about it in your e-mail. Cat Collars. I, personally, would never put a cat collar on an outside cat. Not only would my own outside cats think I’d completely lost my mind, it’s simply far too dangerous. If a cat is, say, in a tree, the collar could easily catch on a branch. Many well-meaning bird-loving cat parents will even put bells on their cat’s collar to warn the birds. I love birds as much as anyone (we even have 4 bird feeding stations in our yard! ), but if a cat is attempting to hide from or get away from a predator, the bell could toll for them in the worst way. It bears mentioning again, so bear with me while I mention it again: Treat cats in the house or yard just as you would treat children in the house and yard. Treat them like babies because they are babies. I know there are other tips and safety hazards out there. If you know of any first-hand, please share them with us in the comments. In the meantime, pass the link to this post around to all cat parents you know. What may seem like common advice to one person can cause another to say, “Wow! I never thought of that!” Every time that’s said… another precious cat can be spared a great deal of pain and suffering. You might even save her life. When it comes to cat vaccinations, cat owners can have a ton of questions. Mostly, the questions center around the safety. We wonder if we should vaccinate our cat and, if we do, will it lengthen her life? Thanks to Paw Nation, much of the mystery and controversy has been dealt with. Paw Nation spoke with veterinarians Kristen Nelson, author of “Coated with Fur: A Vet’s Life,” and Christine Bellezza, co-director of the Feline Health Center at Cornell University. When and why should pet owners vaccinate their cats? Despite that high risk, not all cat owners follow the guidelines. As I’ve said many times before, I have outside cats that are only “outside” cats because of a certain inside baby (Alexa) who I’m afraid wouldn’t be too welcoming. We don’t call her our little spoiled baby for nothing. 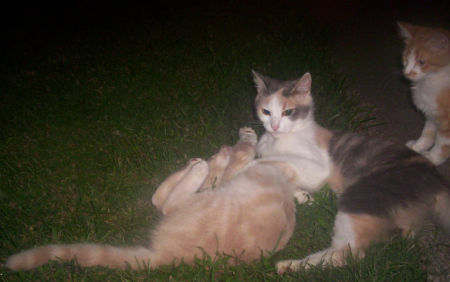 Plus, a few of our outside cats are Ming Li’s kittens – she was a feral cat who it took months of coaxing to even approach. 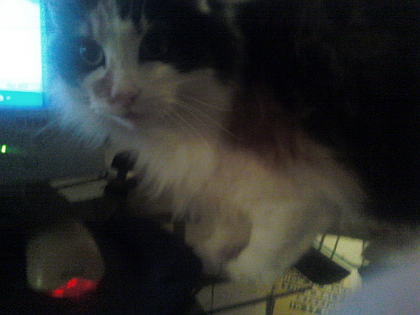 Unfortunately, she’s no longer with us but before she left, I was able to pet her at will – she actually became a pretty big baby, purring constantly. She left behind several babies and, since they were born to such a wild little momma, I’d never stand a chance of picking them up! I can pet two out of three of them regularly. They’re very sweet but picking them up would probably completely freak them out at this point. So bringing them inside is an impossibility. Hannah, of course, can be picked up, hugged, kissed, and held all day… she loves it, the big baby. I’m just very scared of her and Alexa getting into a squabble. Besides, she doesn’t seem to mind living out in the wild. However, with an excessive heat advisory in effect here in Owensboro, Kentucky today – I’ve been doing all I can to cool off my hot little girls and boys. I’ve “iced” Hannah down twice – she loves it! Fatima wants no part of it and the boy cats look at me like I’ve lost my mind completely. Earlier, Fatima (the tiniest little cat in the world) looked on the brink of death – seriously. Her mouth was hanging open and her eyes just didn’t look right. I wet a towel down with cool water and laid it on the ground. She wouldn’t let me rub her with it but when I laid it out on the ground, she laid on top of it. I then took out a big bowl of ice and placed it all around the area she and Hannah were lying in. They both licked the ice and laid down amongst the melting glaciers. One of the boy cats (Bullet) took off for the barn after a long cold drink and the other (Jelly Bean) enjoyed the glaciers with the girls. He’s such a little Romeo. I looked out a few minutes ago (I’ve been checking on them frequently) and they were still chilling nicely. Fatima looks 100 percent better and Hannah seems to be hinting for another ice massage. Soooo…. I’m off to ice my girl down and HOPE the others will allow me to give them one as well. In today’s tip, we’re reminded how important it is to keep out cats toys and playthings safe. Whether your cat prefers expensive store-bought toys or items found around the house, take care to keep your cavorting cat safe. To prevent choking, avoid toys with parts that can become detached during play. Bring out the pounce in your pet with safe choices such as a ping-pong ball or a catnip mouse. Playtime with string or yarn should be carefully supervised to prevent your cat from accidentally swallowing it. Finally, secure free-standing kitty condos and cat towers to the floor or wall to keep them from toppling over. Inspect toys just as you would inspect them for a child. Think of each conceivable possibility – will this small piece come off…. can that get wrapped around her/his neck… that sort of thing. I love the tip above about securing their towers and condos to the wall. Just because you don’t think it could possibly topple over doesn’t mean it won’t. I never in a gazillion years believed Alexa would be able to turn an ironing board over on herself, but she sure managed. Yes, as a matter of fact, she does have to be watched like a toddler. Watch out for newspaper left lying around. If your cat is as inquisitive or playful as Alexa (Heaven help you), they probably like to attack the paper and see how fast they can shred it. Little pieces of newspaper can get stuck on the back of the cat’s tongue and become a choking hazard quickly. While we’re talking about chocking hazards, watch out for the green grass that’s popular in Easter baskets. Like the ribbon and paper, it can become dangerous very fast. Be sure it’s out of your little one’s way. I guess that’s all of the tips I can think of for now… at least until Alexa gets into something else. If you have any to add, please do so in the comments. Click the following link for a wonderful article: 10 Ways to Make Your Cat Younger. 5. Dress-up can be a big mess-up for some pets. Please don’t put your dog or cat in a costume UNLESS you know he or she loves it (yup, a few pets are real hams!). For pets who prefer their “birthday suits,” however, wearing a costume can cause undue stress. 6. If you do dress up your pet, make sure the costume isn’t annoying or unsafe. It should not constrict the animal’s movement or hearing, or impede his ability to breathe or bark. Keep a look out for small, dangling, or easily chewed-off pieces on the costume that your pet could choke on. 7. Take a closer look at your pet’s costume and make sure it does not obstruct her vision in any way. Even the sweetest animals can get snappy when they can’t see.